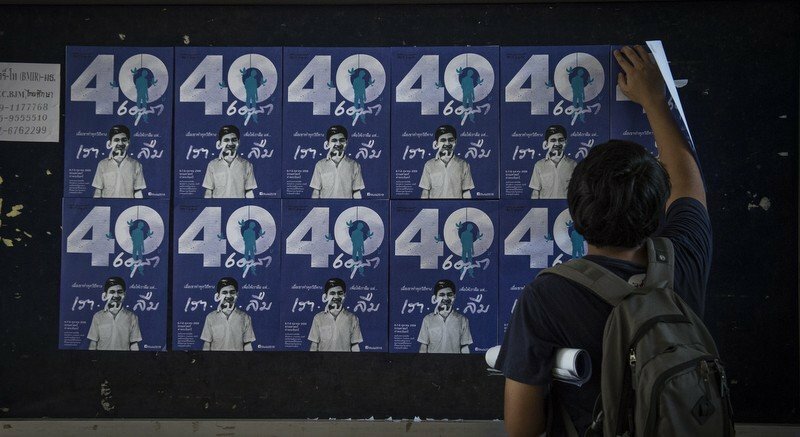 BANGKOK: All victims of political violence, including marginalised members of society, killed in times of turmoil deserve as much recognition as the intellectuals slaughtered in the brutal bloodshed of Oct 6, 1976, say media and political activists. State-sponsored killings had taken place, and perpetrators walked free, before the crackdown on anti-dictatorial demonstrators of October 1976, they say. Among those killed were 33 leaders of the Northern Farmers’ Confederation, state enterprise employees who were hanged and the thousands of people burnt to death in the notorious “Red Drum Killings” in the southern province of Patthalung believed to be associated with the Communist Party of Thailand (CPT). More recently, 98 red-shirt protesters were killed during the 2010 military crackdown, but these “small people” do not receive the proper recognition, said Sarayut Thangprasert, a primary researcher of the now-defunct People’s Information Centre on the April-May 2010 Crackdown. “The casualties from 2010 were seen as victims of politicians’ manipulation while the Oct 6, 1976, deaths were seen as innocent victims as they were intellectuals,'” said the 47-year-old activist, who has been assisting the families of red-shirt victims in post-crackdown court cases and imprisonments. Mr Sarayut, a native of the Northeast, recalled two other incidents in Kalasin province in which people were arbitrarily killed by the state in the 1960s and 1980s. Villagers in Na Ku district were beheaded by security personnel to intimidate potential CPT supporters. Another group of young villagers in Khaowong were assassinated on suspicion of providing supplies to communist rebels. Pimsiri Petchnamrob, another activist traumatised by the military crackdown on red-shirt protesters some six years ago, said the quest for reconciliation simply hit the wall as Thailand lacked basic elements for “transitional justice”. “Pursuing justice, preventing impunity, providing financial assistance, uncovering the truth, remembering the victims, and reforming national human-rights legislation and law enforcement agencies have all lagged behind,” said Ms Pimsiri. Porntip Munkong, 28, a former lese majeste prisoner following her involvement in a play commemorating the 1976 massacre three years ago, said she truly respected and felt sad for the losses of so many young people. However, she says only when people from all corners of Thailand can relate to the loss of life that occurred that day will the issue not be forgotten. “Could we see the similarities of Oct 6, 1976 and those who died in the Krue Se and Tak Bai incidents? We may need to rewrite history so all those people are remembered as heroes,” said Ms Porntip. Tyrell Haberkorn, a human rights expert from Australian National University, said the stories of marginalised victims should be more widely documented. Experiences from other societies show the quest for an answer usually comes from civil society and not government officials, she said. “In Indonesia, there has been a wide-ranging movement to uncover the truth about the 1965-1966 killings and the series of political imprisonments that followed. Part of this is the passage of time and another part is the change in government. It is over 50 years since the violence and close to 20 years since Suharto was pushed out of power,” said Ms Haberkorn. But an attempt to uncover the truth of the 1976 massacre was never recognised by the state. A committee concluded a report in 2000 after interviewing eyewitnesses, examining extensive court evidence. The report was presented to then prime minister Thaksin Shinawatra, but there was no state response. “Thai society must decide how to deal with many forms of damage and injury resulting from the bloodbath of Oct 6. They must study the wider picture of historical events which lead to that morning,” said the report.